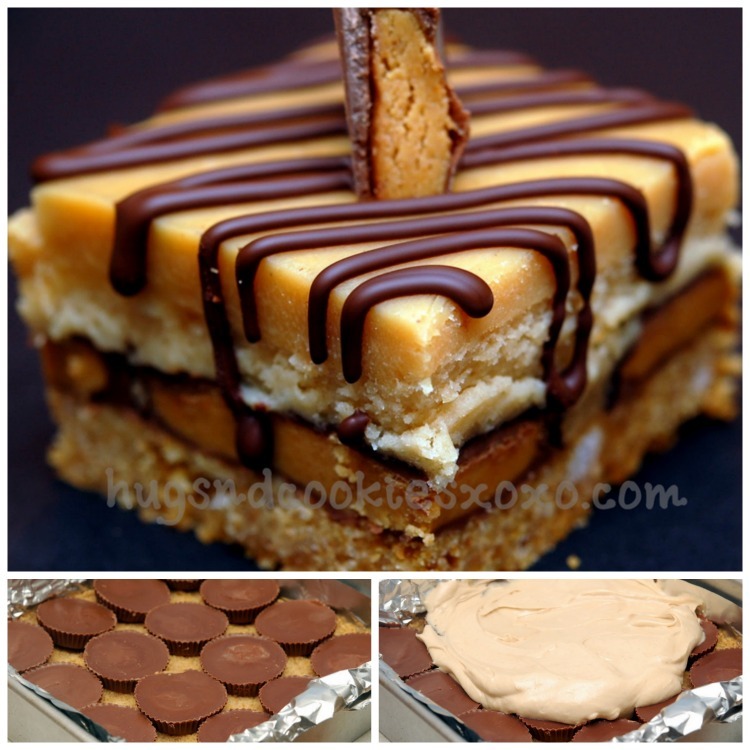 Peanut Butter Cheesecake bars, Oh My! I AM NOT SURE IF YOU BROUGHT YOUR STRETCHY PANTS BUT YOU’RE GOING TO NEED THEM! THESE ARE WORTH THE CALORIES, TRUST ME! 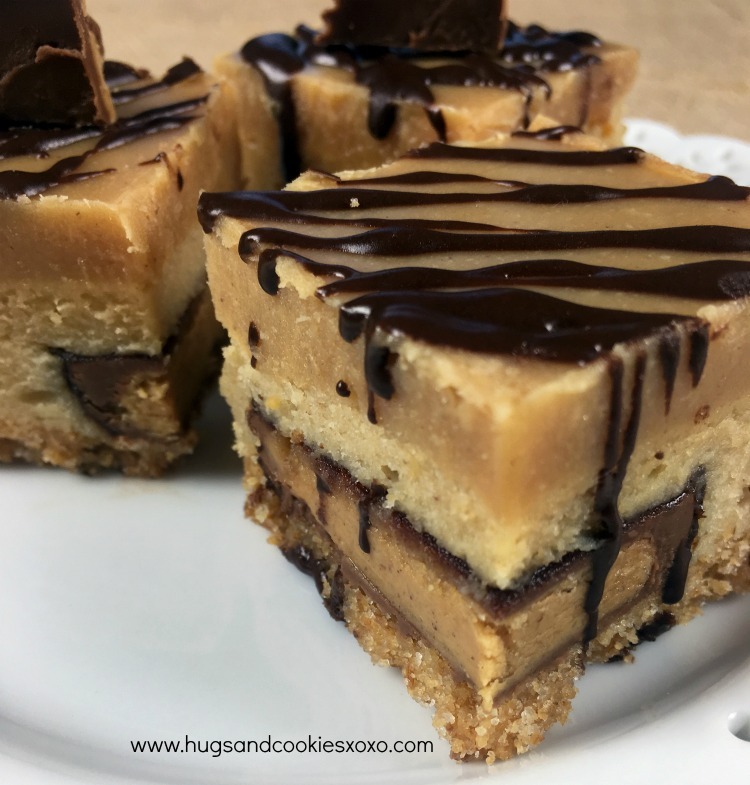 THIS IS A TRUE PEANUT BUTTER LOVER’S TREAT! LET’S GET STARTED! MELT THE BUTTER IN THE MICROWAVE IN A BOWL. STIR IN SUGAR AND CRUMBS. LINE AN 8 INCH PAN WITH NONSTICK FOIL AND PRESS THE CRUMB MIXTURE IN. BAKE ABOUT 9 MINS AT 350 AND LET COOL. ONCE COOL, LINE THE CRUST WITH SNACK SIZE PEANUT BUTTER CUPS TO COVER THE BOTTOM. ELECTRIC MIX CREAM CHEESE AND SUGAR. ADD EGG AND PEANUT BUTTER. POUR OVER PEANUT BUTTER CUPS AND SPREAD OVER CRUST. BAKE 30 MINUTES AT 350. LET COOL COMPLETELY. combine cream and butter in saucepan until hot. Stir in chips till smooth. Add sugar and pour over bars. Chill firm before cutting. 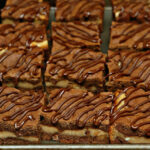 Cut into 9 squares and drizzle melted dark chocolate chips on top of each bar. Keep chilled! Your desserts are always so decadent-this looks just incredible. Very simple making an dyet a fine dessert! Girl, these are insane!!! I love every single thing about them!!!! Seriously, you need to be the one at the Cheesecake Fac that thinks of new desserts. Every recipe that starts with a pic od reeses must be wonderful. But this one: wow. Sunning! Oh wow yum, this looks so good! I swear you’re trying to make me fat or give me diabetes. But if you keep up with recipes like this one, it’ll be worth it! So good! Made them for xmas and now I am making them for NYE! Everyone loved them. I served mine in smaller bars. Thanks for the great recipes! I definitely want to make these!!! How much is a stick of butter in your peanut butter cup cheesecake bars? 1 cup? I bought a stick of butter and used the whole bar and it’s definitely way too much. Instead of being like a crust, it looks more like soup. Just an FYI, when you print out the recipe, the peanut butter cups are not listed in the ingredient section. Loojs good, but sugar overload! Someone has taken your photos from this page and is posting in groups on facebook claiming it is their own. I thought you would like to know. They are also claiming this is their own recipe. I’ve got this cheesecake in the oven right now. My first time for trying get this recipe. Too bad I can’t eat any since chocolate triggers migraines. Thanks for sharing the recipe. 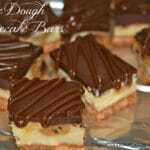 I want to see and will make it and then I will add a layer of crunchy crisp bacon under the peanut butter cups. Could I use semi-sweet chocolate pieces instead of peanut butter. I think it would be okay?! How do you cut them without destroying them? Is there a special trick? Is the ganache layer supposed to be liquidy or runny? Will it eventually set up? Liquidy at first but as it cools it will firm up. Wow! Peanut butter and chocolate overload! Looks SO good! I’m almost finished making the peanut butter cup bars. My final peanut topping is a bit runny, I may add more powdered sugar. But looks great and smells wonderful. i made these once already and it was so good,so rich.My question is this:do i need to get the dark choc really hot and whats the best method for drizzling it over the PBCC bars? I use the microwave to melt it and a pastry bag to drizzle it. Hello!!! Yum!!! In ur opinion, do u think this could be adapted and made into a 9 inch cheesecake using a springform pan? I’ve done Reese and Buckeye cheesecakes… But this one looks amazingly delicious and unique! So, I would LOVE to try it… But want ur opinion… Thanks much!!! hmm, love your idea just not sure how well it would fit!! ?? I’m gonna have to try it sometime… Maybe a couple modifications… But this why looks sooo good! I just get requests to make cheesecakes all the time… So it’s kind of become “my thing”… Lol! Thanks for responding!!! Merry Christmas! How do you display these? Laying on a tray, or packaged individual? OMG!!! I can’t wait to get the ingredients to make all the wonderful deserts & share them with my Friends. . Thank you so very much for posting this. .. Please don’t stop doing this. …..
how exciting!!! The bars do have the ganache, it is actually a peanut butter ganache not a chocolate one. Hope that helps! This is sooo good! I’ve used snack size & mini Reese’s. Delicious! I love peanut butter, but never try it with cheesecake, can’t wait. 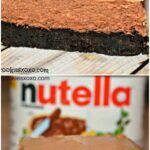 I will try to cook this amazing recipe for my girlfriend, I’m sure she will start loving me more 🙂 Thank you for sharing this amazing dessert with us. hahaha Hope she enjoys it! These look wonderful! 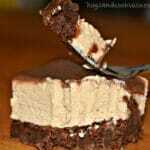 Question can i just omit peanut butter cups and do iust cheesecake? Love all your recipes have used a few in bakery i work at! Just wanted to thank you sooooo much for sharing this recipe. I’ve been making this for my family and coworkers over the past two years and they all rave about them. Keep up the good work and keep sharing these fantastic recipes! Can you make this using the already made Graham cracker crust pies?